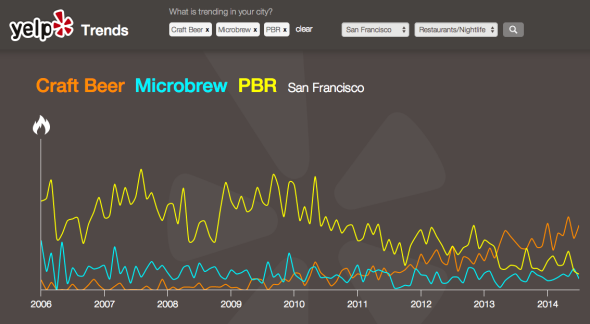 Yelp Trends: Data tool compares cupcakes to macarons, PBR to craft beer, Scotch to bourbon. Watch techies replace hipsters—er, I mean, craft beer replace PBR—in San Francisco. To celebrate its 10th birthday, Yelp has released a tool that will finally tell us exactly when craft beer surpassed PBR, ombre overtook Brazilian blowouts, and macarons began to take a bite out of cupcakes. Yelp Trends is sort of like Google Ngrams for customer reviews instead of books. Enter up to three keywords, then choose your city and business category, and it will plot a graph showing the terms’ relative frequency in Yelp reviews over time. Remember when Ritual was San Francisco’s frothiest coffee roaster? Blue Bottle steamed ahead in about 2008, and Philz followed a few years later. And who says you can’t compare apples to oranges? Feel free to try it yourself and share your results in the comments.